While the Employee Benefits landscape is becoming increasingly complex, it is proportionally significant to rising health care costs and changes throughout the system. Therefore, the ability to analyze plan offerings and compare data to peer employers in the marketplace is paramount. Quick access to this data can provide employers with a competitive advantage. Benchmarking information is often gathered at the national level, resulting in substantial gaps in cost and plan data due to variances in costs of living, average wages and health care markets across many regions. 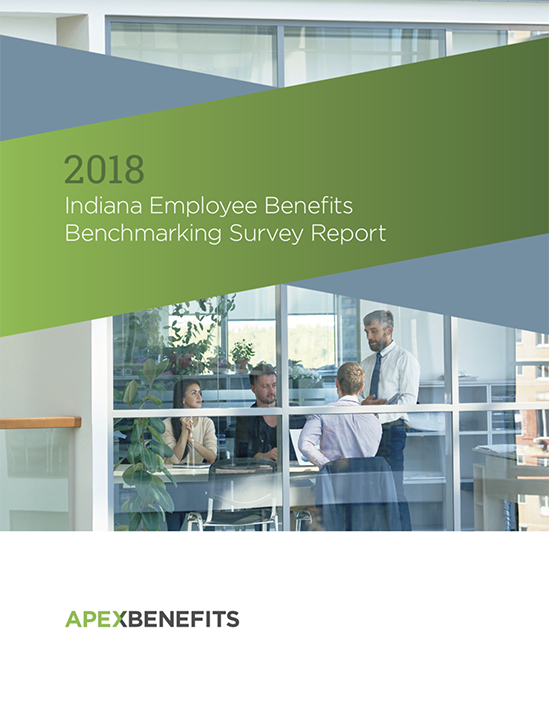 In contrast, the Apex Benefits Benchmarking Survey uses a targeted approach to gather information exclusively from employers based in Indiana. The survey information collected in this year’s report is designed to enable an in-depth and critical evaluation of medical, dental, vision, life, disability, and wellness plans for comparison to plans offered by in-state competitors. The report also includes information on employer best practices, strategies to control costs and other areas of concern. At a time when Indiana has a near record-low unemployment rate of 3%, recruitment and retention of employees is essential for long-term sustainability. As workforce demographics shift with the influx of millennials and the nuances of retirement-minded baby boomers, Indiana employers must adapt to remain relevant. The information provided in this benchmarking report is vital to staying competitive in the marketplace – and could make all the difference in retaining valued employees who are at the heart of every successful company.